"Promenade" redirects here. For other uses, see Promenade (disambiguation) and Esplanade (disambiguation). 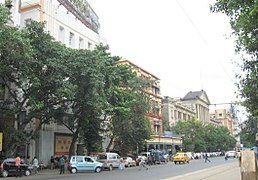 For the neighbourhood of Kolkata, see Esplanade, Kolkata. 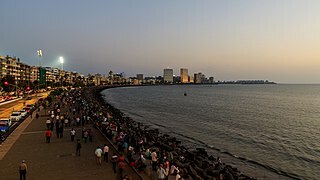 An esplanade or promenade is a long, open, level area, usually next to a river or large body of water, where people may walk. 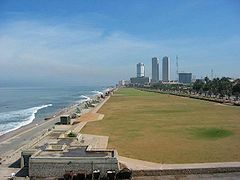 The historical definition of esplanade was a large, open, level area outside fortress or city walls to provide clear fields of fire for the fortress's guns. 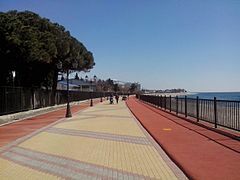 In modern usage the space allows people to pave the area as a pedestrian walk; esplanades are often on sea fronts, and allow walking whatever the state of the tide, without having to walk on the beach. Esplanades became popular in Victorian times when it was fashionable to visit seaside resorts. A promenade, often abbreviated to '(the) prom', was an area where people – couples and families especially – would go to walk for a while in order to 'be seen' and be considered part of 'society'. In the United States of America, esplanade has another meaning, being also a median (strip of raised land) dividing a roadway or boulevard. Sometimes they are just strips of grass, or some may have gardens and trees. Some roadway esplanades may be used as parks with a walking/jogging trail and benches. 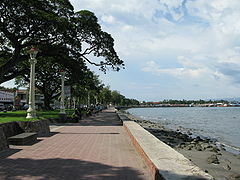 Esplanade and promenade are sometimes used interchangeably. 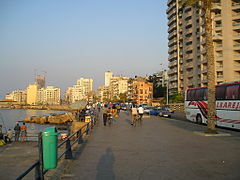 The derivation of "promenade" indicates a place specifically intended for walking, though many modern promenades and esplanades also allow bicycles and other nonmotorized transport. Some esplanades also include large boulevards or avenues where cars are permitted. 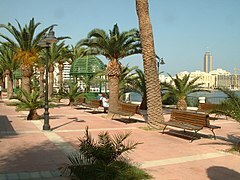 A similar term with the same meaning in the eastern coastal region of Spain is rambla, but it is more widely referred to as paseo marítimo ("esplanade"), paseo ("promenade") or explanada ("esplanade") in the rest of the Hispanic world. 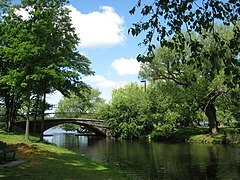 Wikimedia Commons has media related to Esplanades.